If you don’t have a barbecue, you can use an oven and follow the same directions. Keeping the temperature with heat beads is a little more difficult (but tastes heaps better); I would recommend waiting around 30 minutes after your heat beads have turned white before you put your lamb on - for example, if I'm cooking for a few people, I would cook the entrée on the hot heat beads first, then pop the lamb on for the second course and let it slow cook while I entertain! Line a tray with enough foil to wrap around the top of the lamb. Place your lamb on top of foil. Splash on some olive oil, garlic, oregano, rosemary, peppercorns and sea salt. Give the lamb a nice massage. In the meantime, preheat a hooded BBQ to 160˚C. 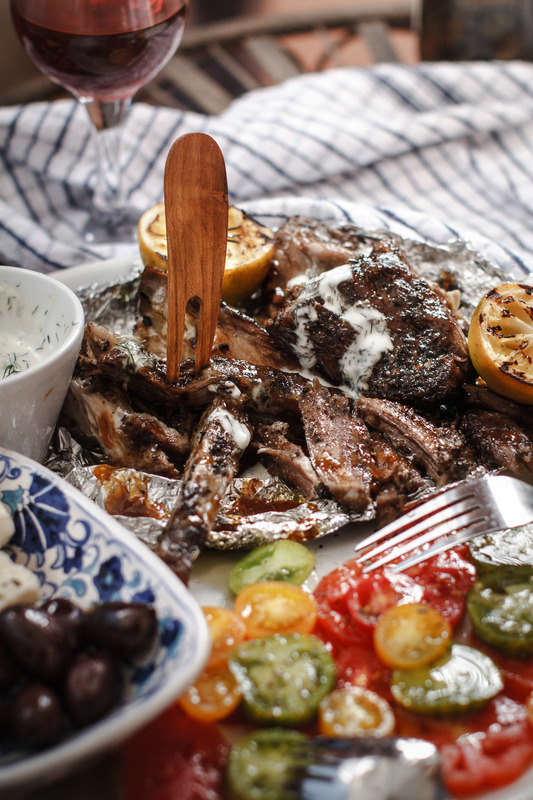 While your BBQ is heating to 160˚C, let your lamb rest to room temperature. Add a splash of wine around the lamb, and cover it with the foil. Pop onto your BBQ grill, and cook for 1.5-2 hours. Take off the BBQ hood and check if the lamb's nice and tender, if you're not happy with it fear not - simply cook it for longer! Pour all the juices from the lamb into a pan and set aside. Turn up your BBQ to the hottest setting, take your lamb out of the foil and pop on top of the grill until it gets some nice crispy colour on each side, then wrap the lamb back in the foil, cover and rest for about 5-10 minutes. While your lamb is resting, heat the pan with the reserved juices (you can add a little splash of wine if you like) and reduce until it has thickened a little. Slice the lamb, and pour the juices over it right before serving - you can pour at the table to make your guest salivate! Serve with lemon wedges, some pita, salad, fetta - and don’t forget the tzatziki! * Cooking times will vary depending on the size of your lamb shoulder, if you're using a 2kg lamb shoulder cook it for 2.5 hours, etc. ** Dried Greek mountain oregano (Rigani) can be found in most Mediterranean grocers. It usually comes in a package about 30cm in length, as the flower tops and leaf cuttings of the plant are harvested whole. All you have to do is squeeze the bunch a little with your hand to release it from its twig - you can use 'normal' oregano if you can't find the good Greek stuff!